A group of scientists led by researchers from the California Institute of Technology has engineered a type of artificial optical material—a metamaterial—with a particular three-dimensional structure such that light exhibits a negative index of refraction upon entering the material. In other words, this material bends light in the "wrong" direction from what normally would be expected, irrespective of the angle of the approaching light. This new type of negative-index metamaterial (NIM), described in an advance online publication in the journal Nature Materials, is simpler than previous NIMs—requiring only a single functional layer—and yet more versatile, in that it can handle light with any polarization over a broad range of incident angles. And it can do all of this in the blue part of the visible spectrum, making it "the first negative index metamaterial to operate at visible frequencies," says graduate student Stanley Burgos, a researcher at the Light-Material Interactions in Energy Conversion Energy Frontier Research Center at Caltech and the paper's first author. What makes this NIM unique, says Burgos, is its engineering. "The source of the negative-index response is fundamentally different from that of previous NIM designs," he explains. 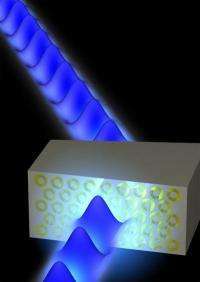 Those previous efforts used multiple layers of "resonant elements" to refract the light in this unusual way, while this version is composed of a single layer of silver permeated with "coupled plasmonic waveguide elements." Surface plasmons are light waves coupled to waves of electrons at the interface between a metal and a dielectric (a non-conducting material like air). Plasmonic waveguide elements route these coupled waves through the material. Not only is this material more feasible to fabricate than those previously used, Burgos says, it also allows for simple "tuning" of the negative-index response; by changing the materials used, or the geometry of the waveguide, the NIM can be tuned to respond to a different wavelength of light coming from nearly any angle with any polarization. "By carefully engineering the coupling between such waveguide elements, it was possible to develop a material with a nearly isotopic refractive index tuned to operate at visible frequencies." This sort of functional flexibility is critical if the material is to be used in a wide variety of ways, says Atwater. "For practical applications, it is very important for a material's response to be insensitive to both incidence angle and polarization," he says. "Take eyeglasses, for example. In order for them to properly focus light reflected off an object on the back of your eye, they must be able to accept and focus light coming from a broad range of angles, independent of polarization. Said another way, their response must be nearly isotropic. Our metamaterial has the same capabilities in terms of its response to incident light." This means the new metamaterial is particularly well suited to use in solar cells, Atwater adds. "The fact that our NIM design is tunable means we could potentially tune its index response to better match the solar spectrum, allowing for the development of broadband wide-angle metamaterials that could enhance light collection in solar cells," he explains. "And the fact that the metamaterial has a wide-angle response is important because it means that it can 'accept' light from a broad range of angles. In the case of solar cells, this means more light collection and less reflected or 'wasted' light." "This work stands out because, through careful engineering, greater simplicity has been achieved," says Ares Rosakis, chair of the Division of Engineering and Applied Science at Caltech and Theodore von Kármán Professor of Aeronautics and Mechanical Engineering. More information: "A single-layer wide-angle negative index metamaterial at visible frequencies," Nature Materials, April 2010. Finally, I can get my invisibility cloak. But seriously, I love it when things once thought impossible come to fruition. material with a nearly isotopic refractive index tuned to operate at visible frequencies." Metamaterials might come along for consumer use much sooner than was predicted. I'm predicting they will extend to the rest of the visible spectrum before years end. I sure hope they do that is. EM blackholes will be a whole new department of research, much more efficient than regular solar cells and the like. yea...that was a fun couple of years. Nothing like explaining that particle accelerators can't destroy the planet over and over to completely destroy your faith in humanity. Blackhole is a misnomer-Electromagnetic Wave guide helps to retrieve Energy. LHC concepts are wrong and mislead Spirit of Science. Spiffiness! I know full well that there's plenty that one could do with metamaterials for longer wavelengths, but...my little human selfishness still can't help but be ecstatic to finally have some of this weirdness that I can actually SEE (or not see, in the case of invisibility cloaks). Excellent news. If this can be made practical, expect its to be outlawed. Probably already is if used to disguise your identity. Where did I put my invisibilty cloak. Not much point in looking for it I suppose. "The fact that our NIM design is tunable means we could potentially tune its index response to better match the solar spectrum, allowing for the development of broadband wide-angle metamaterials that could enhance light collection in solar cells," he explains. I wonder how they make the jump from optimizing a particular frequency, to broadband.